The well known New Zealand boatyard Alloy Yachts International has released the details of its biggest ever motoryacht: "Sine qua non" is its name, appearing on the transom in the acronym S.Q.N.. 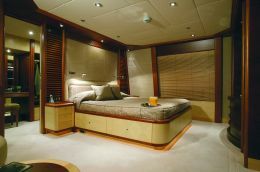 The boat was built for the specific requirements of Alloy Yachts International president Gary Lane. 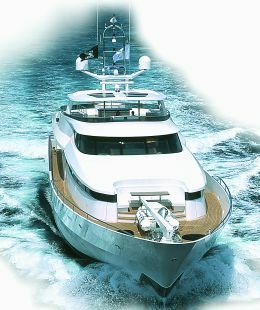 Designed by Dubois Naval Architects, with interiors by the Don Starkey Design studio, "S.Q.N." began to become a reality in July 2001 when the design phase gave way to the creation of the first structural elements in the New Zealand boatyard. Launching took place one and a half years later, on 8th February 2003 to be precise, in time for its owner to take part in the superyacht race NZ Millennium Cup which started on the 10th. In April of the same year "S.Q.N." reached the Mediterranean where she currently remains. 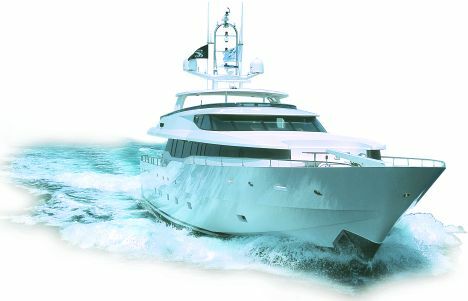 For further information contact Alloy Yachts International, 1 Selwood Road, Henderson, Auckland, New Zealand, P.O. Box 21480, Henderson; tel. 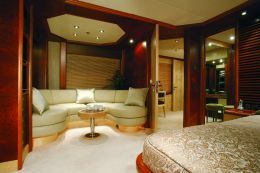 +64 9 838 7350; fax +64 9 838 7393; website www.alloyyachts.co.nz; e-mail mailbox@alloyyachts.co.nz. Hull and superstructure are entirely in aluminium, a choice which allowed the boatyard to manage weights, optimising the distribution to full advantage of performance and stability. It is designed on three decks of which the upper houses the bridge, forward and extending across the whole beam, with the wheelhouse in a central position. Aft there is an open air living area sheltered by a rigid structure that follows the shape of the deck surface but leaves plenty of space to the environment, thanks to the absence of vertical structures. 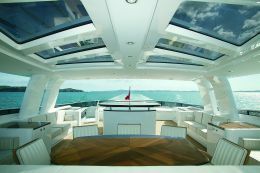 The aft zone of this deck houses a Jacuzzi equipped with flow generation for swimming. The vessel is 39 metres long with an 8.50 metre beam, dimensions that allowed the designers to develop interiors in line with the owner's requirements but without having recourse to stylistic forcing that would have compromised the pleasing aesthetics of the whole. 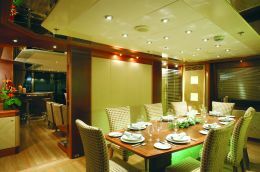 The main deck has a spacious cockpit, almost totally sheltered by the aft projection of the flying bridge, with a dining area and a foldaway table that seats ten comfortably. Athwartship on the transom there is a sofa that follows the curve of the structure while at the sides there are two safe and handy companionways down to the spacious stern bridge. From the cockpit you access the indoor saloon through an automatic glass door. Here there is a corner bar, a card table, sofas, armchairs and numerous accessories for relaxation. Forward there is the area for formal dinners which stretches the whole width of the superstructure and has a table that comfortably seats ten. 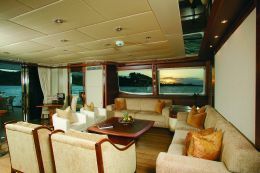 On the same deck, slightly forward of the amidships area, the indoor bridge, which is actually developed on an intermediate level between the main and upper decks, is equipped with an office corner, private bathroom and the wheelhouse in a central position with windows that ensure 180° visibility. Forward of the bridge there is a spacious study and the owner's cabin with a private lounge, two bathrooms, double bedroom, dressing room and large perimeter windows also offering a 180° panorama. The open area forward on this deck houses a tender and davits for handling. There is another tender aft, a Rib Novurania 530 DL, in the garage under the cockpit sole, handled by electro-hydraulic systems, as is the jet-ski Sea Doo GTX 4 Tec which is kept in the same place. As the owner is a scuba enthusiast the garage aft has a station for refilling air bottles. The lower deck of "S.Q.N." has two spacious adjacent double-bed cabins with en suite bathrooms, plus another with twin beds on the starboard side, also with private bathroom. Then there is a gym which, on request, can be transformed into another double cabin. The interiors are all in precious wood which lends each environment a high level of welcome and elegance, consonant with the importance of the design. 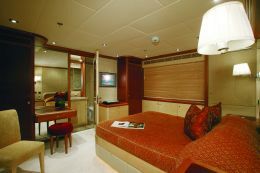 Forward of the guest area, the lower deck houses the skipper's cabin and two double cabins for the crew, plus bathrooms and relaxation areas for personnel. 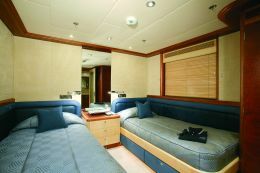 All the rooms on board have plasma screen and DVD reader, including the saloon and the gym, for a total of eight independent systems. Moreover, each room has a hi-fi system with cordless headset, thus avoiding disturbance of other guests' privacy. These are only a few of the details developed by the designers to ensure maximum comfort for all those aboard during a cruise. But special attention was paid by Alloy Yachts in the development of safety apparatus. 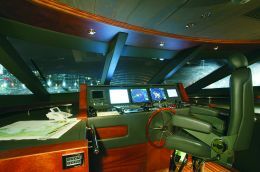 For example the smoke and fire detector system that operates in every corner of the yacht , systems for the control of on-board plant by means of touchscreen technology, surveillance cameras in all sensitive areas such as in the engine room and externally for 360° observation around the vessel . All this is additional to what is prescribed by MCA regulations, to which "S.Q.N." corresponds in every structure and compartmentalisation. Alloy Yachts has also paid special attention to soundproofing the interiors by means of sound-absorbing materials that ensure total heat and sound insulation with regard to the exterior. The structure as it stands also guarantees considerable absorption of vibrations, with top comfort under all points of sailing. Of course the on-board electronic systems are in line with the vessel's potentialities and with international standards for this type of boat. "S.Q.N." is an exclusive yacht which its owner was able to build by daily taking part in its construction and with the possibility of intervening in the smallest detail in order to obtain a custom built superyacht.